The APP Ecosystem: Can a Decentralized Sharing Economy Resolve Itself? Can a Decentralized Sharing Economy Resolve Itself? For nearly two decades, technology’s rise proceeded unfettered, and it led to tremendous growth for the economy and the tangible ways we live our lives. This phenomenon gave rise to things like chord cutting, social media, automation, and the sharing economy. In many ways, the growth of technology changed our lives for the better by making things cheaper, more convenient, and more progressive. However, a series of missteps are causing many to question this presumption. For example, Facebook is mired in a seemingly endless string of scandals involving user privacy, data manipulation, and propaganda. This week, Arizona suspended Uber’s testing of its driverless car initiative after a pedestrian was struck and killed by an autonomous vehicle. Khan is expressing the growing concern that new technology and new services are emerging so rapidly that we barely have time to adjust before the next one rises to prominence. It’s growth without care, and that’s concerning. For the sharing economy, this is especially important. It’s possible that favorite companies like Uber, Airbnb, or Lyft could merely become technologically fascinating versions of existing platforms. It’s not hard to imagine Uber as a taxi company that has an enthralling app and worse working conditions for its drivers. For many, the answer to these concerns is government regulation. While this will undoubtedly play an essential role in shaping the sharing economy, it’s not the only option. Competitive markets and informed consumers will also make a significant impact on this as well. In its current form, the sharing economy exists as dozens or even hundreds of disparate platforms that are similar in their underlying ethos that values mobile technology and individual autonomy. There is no central marketplace for these apps or services. Instead, they are all served a la carte, so it’s difficult to compare services and make informed decisions. Cryptocurrencies and the blockchain can help with this. Digital currencies, as their name suggests, are particularly adept at facilitating digital payments in a mobile environment. What’s more, platforms can build upon the blockchain to create better services for promoting the sharing economy. For example, ShareRing is a blockchain-based marketplace for the sharing economy that brings together the many different services that comprise this market and makes them all accessible from a single app. Users can pay for services using a native digital currency that is transferable to other services or can be converted into fiat money. In addition to making the sharing economy more user-friendly, platforms like ShareRing represent an opportunity for self-regulation. 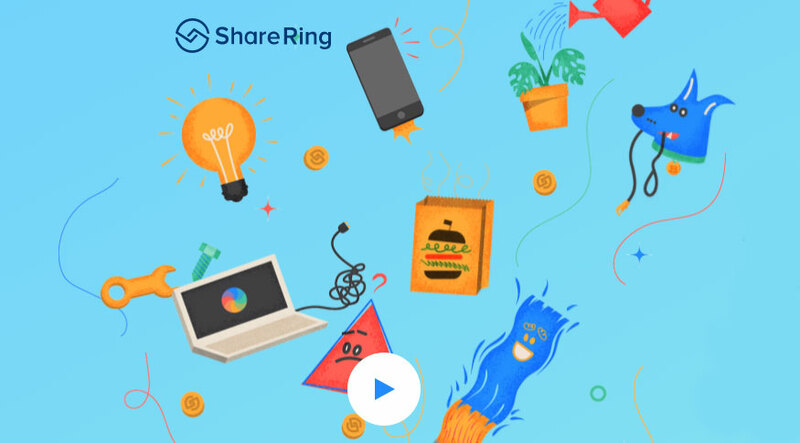 Much like Amazon provides a single marketplace for a plethora of tangible goods, ShareRing present sharing services in a single marketplace. Amazon compares products by several different quantifiers including price, customer reviews, and availability. similarly, a sharing economy marketplace can compare services so that customers can make the most informed decisions and so that everyone can more fully understand the different functions, their strengths, and limitations.